In 1981, soon after starting in general practice following six years in hospital medicine, I became intrigued by the success a fellow doctor in my practice was having with acupuncture. Later that year, he died suddenly and tragically at the age of 42, and I became determined to continue his legacy and to learn and practice acupuncture to the best of my ability. Over the following years, I developed a deeper understanding of its role in helping both the straightforward and the complex medical conditions presenting to me every day. Folk with sore necks and backs often walked out of my office completely relieved of pain, while others with chronic diseases were able to reduce their unhealthy dependence on prescription drugs. As a result I prescribed less, and my patients were excited by, and very supportive of, this valuable new service our practice was offering. Along with several other enthusiastic MDs here in New Zealand, I became determined to understand the reasons why acupuncture was so helpful. We studied both the Western, biochemical research and the traditional Chinese philosophies, now closely aligned to the developing science of biophysics. This holistic paradigm linked our emotions with our physical health – and I found that these principles could be easily relayed to my patients, many of whom already had a deep innate understanding of these relationships. This led to closer bonds being formed between us, with those seeking my help becoming true partners and owners of their healing. In the 90s, I became determined to discover ways to make the changes I was witnessing more sustainable, by further involving people in their deep healing process. I encouraged them to explore their unique creativity, to take up martial arts, yoga, tai chi, and simple forms of meditation. I began to realise the struggles we all face with our health, and our lives in general, could be regarded as important catalysts for change. I witnessed the consciousness of many who engaged in their health in this way to grow, with many silver linings often appearing around the apparent dark clouds of ill health. My consultations now take much longer than when I first started out. Our first meeting lasts an hour and a half, as we explore the childhood and generational roots of ill health and suffering. If we have time, I use acupuncture to guide the person into a state of deep relaxation, encouraging them to breathe gently allowing their abdomen to rise with each breath. On subsequent visits, we explore gentle and simple energy psychology exercises, which often can take the place of our acupuncture sessions. This process leads to the person taking full ownership of their health, and their life. Over the next three months I’ll explain precisely how I adapt energy psychology and EFT techniques to assist the healing of the many chronic conditions that present to me. And I’ll speculate on how an understanding of ourselves as fractal, holographic beings living within a fractal, holographic universe, may shed light on the reasons why these simple and remarkable techniques are proving to be so effective. People come to me in the midst of chaos. Their symptoms are persisting despite their daily cocktail of powerful pharmaceuticals, and despite frequent visits to therapists and healers. They come in pain, exhausted, despondent yet still possessing a glimmer of hope that relief will come somehow, some day soon. They arrive at our home - or rather through a special entrance to a small waiting area - to be greeted by my wife Trish, and most likely our fluffy ‘cavoodle’ Lily. Our role is first and foremost to create a welcoming, safe place to listen to a unique and complex story, told the very way the person wishes to recount it. This joint listening session frequently takes over an hour, if the person’s energy allows this. When someone really listens to the words we say, we hear them too, this time with renewed clarity. Guided compassionate listening is perhaps the most potent of all healing acts. As people are seeing me as a doctor, it is of course important at this point that I carry out any necessary physical examination, and arrange any tests that may still be needed. Many are still worried that something serious has been missed by other doctors, and this needs to be addressed before we embark on other deep healing work. If time allows, we will make good use of our shared heart coherence, or resonance, by offering a simple acupuncture balancing session, focussing on acupuncture points indicated by the person’s condition. The aim is to induce a state of relaxation, and a loving acceptance ‘within’ that can be reproduced simply and effectively by exercises performed in the privacy of their own home. Firstly, create a welcome, relaxing and receptive feeling within yourself by breathing gently to your abdomen. You become no longer ‘on guard and defensive.’ Allow yourself to smile. Fourthly, and integral to the whole procedure, become aware of how you are beginning to take full ownership of your well-being. Understandably, it takes some time for many to become comfortable with this new approach. The essence of the therapist’s work is to carry each client, gently and securely, over this threshold – a role akin to parenting a child from innocence, through adolescence to adulthood. Although, as with parenting, this can prove both exasperating and demanding, it is, in the end, far and away the most fulfilling experience of all. In the next article, I’ll outline the emerging scientific evidence that our body’s acupuncture meridians are planes of semi-conductive connective tissue, extending as a web into every cell of our body. By turning our attention to the access points, or acupuncture points, on our own meridians, we can effectively and simply reproduce the sense of healing and balance achieved at an acupuncture treatment. Since introducing EFT and other Energy Psychology techniques into my practice five years ago, I have needed to perform considerably less acupuncture, and prescribe far less medication, to achieve an improvement in the health of those seeking my help. I have also found that working in partnership with people so focussed on their own healing is deeply satisfying for me, both professionally and personally. In fact, it totally sustains me – allowing me to greet each new day with curiosity, enthusiasm, and perhaps most importantly of all, true happiness. We are connective tissue. We feel the most fulfilled when we are connecting with others, in harmony with the goodness in the world around us, yet striving to improve the lot of those less fortunate than ourselves. In this state, our immune systems are functioning at their optimum capacity, able to cope with, yet not overreact to, pathogens such as viruses, bacteria and parasites, and chemical and emotional toxins. The aim of all healing practices is to enhance this state of connectivity. Yet, it can only be achieved when there is harmony within –a state of acceptance and compassion for ourselves. This is why Energy Psychology exercises such as EFT are so powerful, and why our outside world opens up to us once our inner world is primed and ready. I realised this soon after introducing acupuncture into my medical practice 30 years ago. If we created a sense of harmony and acceptance in my consulting room, this would be transmitted into the receiver of acupuncture. Each needle would act as an antenna, and when placed in the correct positions, the body itself would become an effective ‘human antenna.’ The person would then learn techniques that would induce this state without the need for needles. We now have science that begins to explain just why this is so. We understand that in addition to the human anatomy we all learn in high school, and at medical school, there is an intricate network of connective tissue extending as a tree-like fractal web into every cell of our body. It is therefore known as our cytoskeleton. We know that this cytoskeleton does far more than simply hold our body parts tightly together. It forms a crystalline matrix of protein and water molecules that allows subtle energy to be transmitted throughout our body. If we envisage the cytoskeleton as a tree, then the main branches are our meridians, dividing into ever smaller branches until they infiltrate our cells as tiny twigs. In 2002, Professor Helen Langevin from the University of Vermont published groundbreaking research that shows an “80% correspondence between the sites of acupuncture points and the location of intermuscular or intramuscular connective tissue planes in post-mortem tissue sections.” Our acupuncture points are therefore our points of access into this cytoskeleton of connective tissue, places where information flows freely back and forth between our body and the outside world. The acupuncturist will ‘open’ these points using needles. She may introduce energy in the form of heat by burning the herb moxa over, or attached to, the needle. She may just warm the point with moxa. The practitioner of acupressure will gentle massage these points to good effect. As the readers of this article will all know, those who practise EFT will access these points to great effect by simply tapping or through light touch, becoming their own self-healers in the process! But what is actually happening within our cells when we access this tree- like cytoskeleton? If we examine under a microscope the tiny ‘twigs’ that infiltrate each cell, we see structures know as ‘microtubules.’ We are only beginning to discover how vitally important these microtubules are to every aspect of our being. For example, they form the spindles that ‘pull’ the nucleus of each cell apart, as it divides into two. And there is growing scientific evidence that the microtubules in our brain are the site where the quantum world ‘collapses down’ into the classical world of our perception. And so these tiny structures that form the end branches of our cytoskeleton are involved both in the growth and repair of our bodies, and in how we as humans consciously perceive the world. It is exciting to think that we are exploring ways that we can access and influence this vital healing network. Energy Psychology techniques represent a major advance as they are effective, less invasive and encourage less dependence on therapists. Not only are they simple and cheap to perform, they encourage users to understand the vital role self-compassion can play in their healing. This awareness empowers them to take ownership and control of their health, and of their lives in general. So often I have witnessed a significant shift in the consciousness within those who begin to master these techniques. In the final article, I’ll explore how and why a state of pure energetic balance in our cytoskeleton can lead to such profound healing, and why the focus of our attention, and intention, should rest primarily on our most powerfully energetic organ – our heart. Understanding this is the key that opens us up to new levels of wellness. I have been attracted to acupuncture over the years for a number of reasons. First, and foremost, when used wisely, it works. Second, again when used wisely, it is safe. It has also allowed me to prescribe less potentially dangerous medicines, and save many from spinal surgery. But I have to admit my enthusiasm is also deeply personal, appealing as much to the creative artist as the analytical scientist in me. Devising an acupuncture treatment is not simply a linear, deductive process. For example, although it is important to understand the significance of each individual acupuncture point one is selecting, it is of equal importance to choose points that in combination treat the whole person. The human body communicates directly to us any imbalances with sensations we have learned to call ‘symptoms.’ The word ‘symptom’ comes from an ancient Greek word simply meaning a ‘happening.’ So symptoms are simply happenings or messages that command our attention, requiring us firstly to listen to them, and then to change our ways if we are to avoid further misery or discomfort. I can’t help remember here the last time I suffered a hangover from a night of overindulgence! I have long regarded acupuncture as playing its part in this dialog – replying tactilely to a pattern of messages, letting the body know that its is being ‘heard.’ The geometric pattern created by the needles on the body is as important as the points themselves –just as a great work of art, or symphony, is always far more than a sum of its parts. I view EFT in precisely the same way – a special and intimate dialog with our body - some would say our subconscious mind or soul – with a pattern of tapping and phrases indicating not only that it is being heard, loud and clear, but that it is being cared for with the utmost compassion. The Chinese have taught us that ideal health is achieved when our bodies are in balance – our yin energies in perfect balance with our yang energies. The yin and yang symbol is the perfect representation of this balance. In physics, we also see this balance in the opposing spins of electrons orbiting atoms in the state of entanglement. We can understand this balance better when we examine the classical symbol of infinity - the figure eight, lying horizontally rather than vertically. This shape is also known as the lemniscate, derived from a Latin word meaning a ribbon. If we pick up a piece of ribbon and form a figure of eight shape, giving the ribbon a twist so opposing sides join, we have effectively formed our infinity sign, or as it is also known, our version of a Möbius strip. If an electrical current is passed through an electrical wire wrapped tightly around a metal ring shaped as a figure eight, otherwise known as a Möbius coil, the positive and negative currents equal each other out. We are left instead with a central vacuum for energy beyond magnetism – beyond the confines of our four dimensions. This energy is known by a variety of names – scalar energy, zero-point energy, free energy etc. It is my job as a therapist to create this state of yin/yang balance within the energetic body of the person seeking my help, so that she or he can gain access to this nonlocal, non temporal energy. When this happens the person once again feels in balance with the world - in other words healed and healthy. The gift of EFT is that each person becomes their own personal healer, creating their own perfect balance. For their more immediate symptoms, I teach the tapping methods so well demonstrated on this website, explaining the ritual as a work of art performed lovingly on themselves. However for those with chronic illnesses – the majority who present to me – I encourage a further exercise to be performed every night in bed before falling asleep. Firstly, their hands are placed palm downwards over their sternum, or breast plate. Their arms therefore form a figure-of-eight shape, with a meeting, or zero, point over the centre of their chest. Secondly, a gentle abdominal breathing pattern is established, ensuring the mind and the body is calm and relaxed. Thirdly, the ‘Even though…’ phrase is repeated three times, using their dominant presenting symptom ie pain, fatigue, sleeplessness, anxiety, sadness etc. 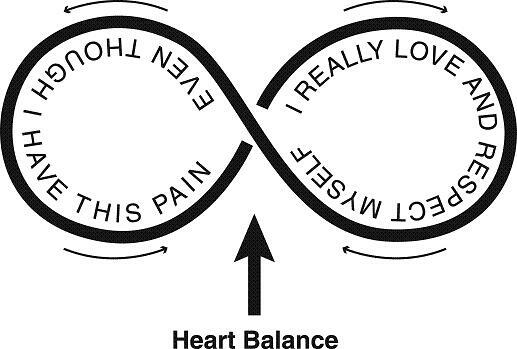 I have found that visualising the words within an infinity sign really helps people connect with this exercise. Many find they now fall asleep with their ‘hands over their heart’, waking in the morning in the same position, refreshed and optimistic about the day that lies ahead.